I visited this location early Sunday morning and discovered that there was nowhere close to park. 72nd St is very narrow with ditches on both sides and people were causing problems for the local farmers. 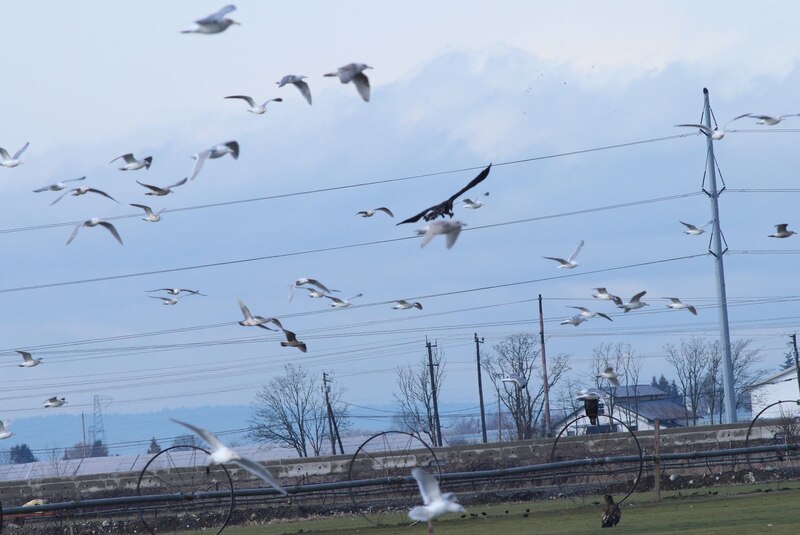 The turf farm has been popular since New Year with a few rarities, and the Eagles in the nearby trees attract a lot of photographers. Since my last visit, Delta had put up no parking signs and barricades. I found a spot at the nearby dog-walking park and hiked on over to the turf farm with my scope and camera gear. I was hoping to see the Black-headed Gull that had been on the bird alert since Christmas. There's also been a Rusty Blackbird seen at the location for quite a while. The challenge is that there are hundreds of Gulls on the site, most of them Glaucous-winged. I did not see the Black-headed but did spot a Gull that was somewhat different. It looked like a Gull that had been posted on a local birding site with a request for identification. 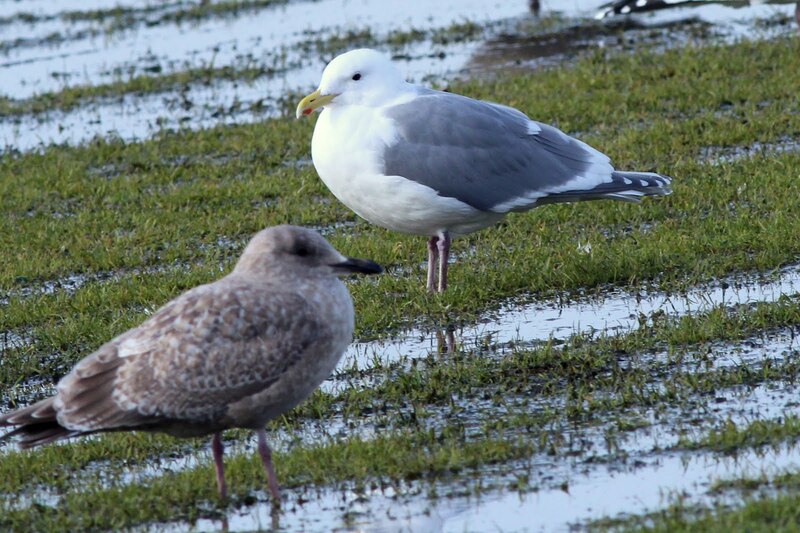 The answer was Thayer's Gull. The photo shows and adult on the right and a juvenile in the foreground. 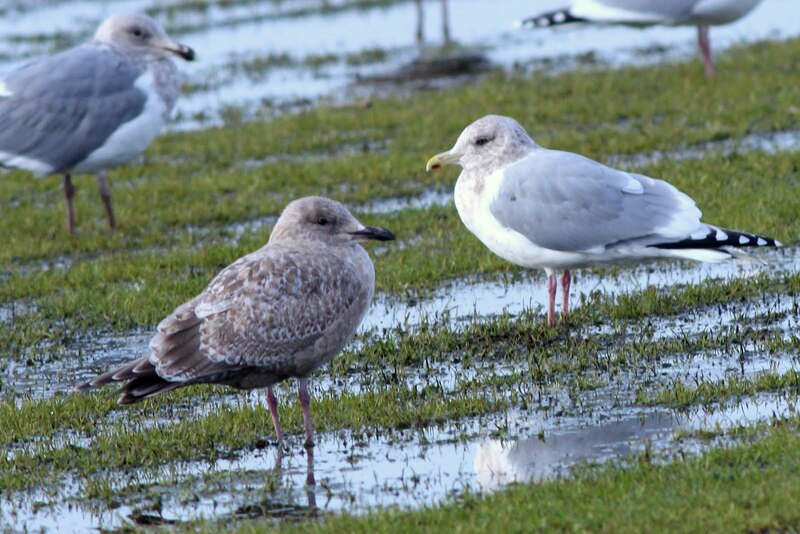 The ID marks for the adult are the dark pink legs, the darker wingtips and the red spot on the bill. The photo below shows the marks on the adult even better. The dark eye is more common with the bird, but the yellowish eye on the one above can occur as well. In with the Gulls are a number of Bald Eagles, perched on the wagon-wheel sprinklers. Every so often an Eagle will charge at a group of Gulls hoping to catch one for a meal. This causes all the gulls to take flight. 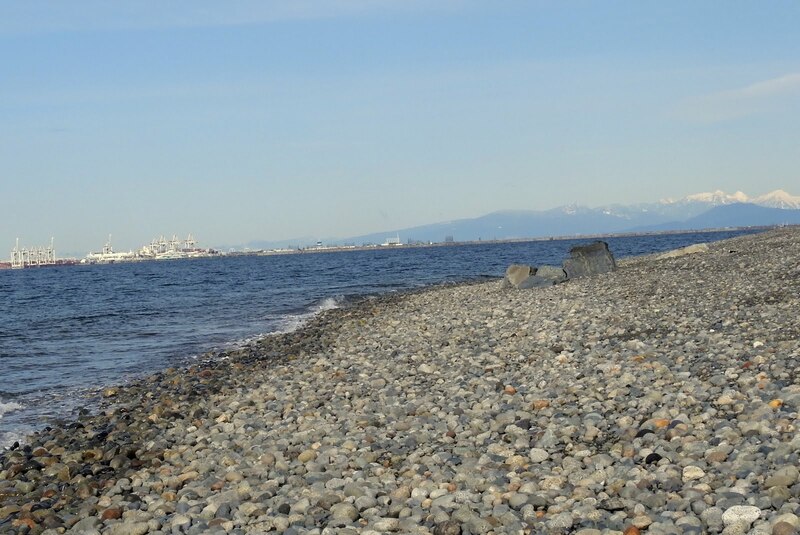 I trudged back to my car and decided to check out Point Roberts, I hadn't been there yet in 2017. I'd been meaning to get to Point Roberts early in the year as it's the best place to find Harlequin Ducks and Red-breasted Mergansers. 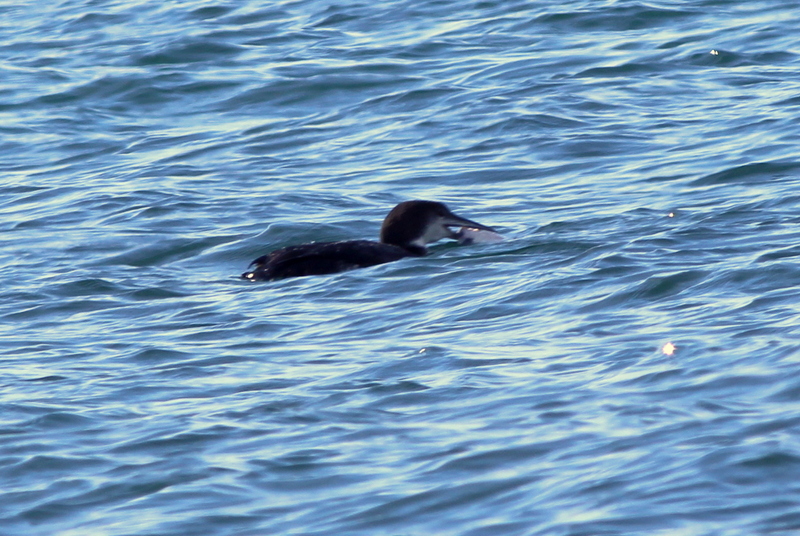 I also expected to add one or more Loon species to my list. It was cold there and the wind was blowing. This creates waves which make it hard to get good photos of the bobbing ducks. To add to my problems the sun was in my face which makes for poor photos as well. 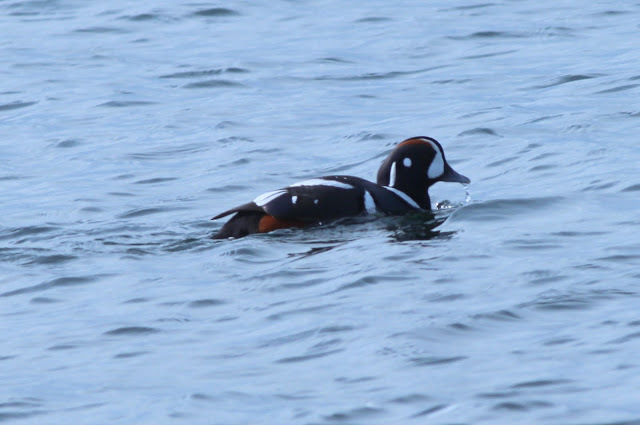 I did see Harlequin Ducks as expected, this is the best shot I managed of the colourful male. I also spotted a female Red-breasted Merganser, and took a couple of mediocre shots. I've never seen a male here, only females. 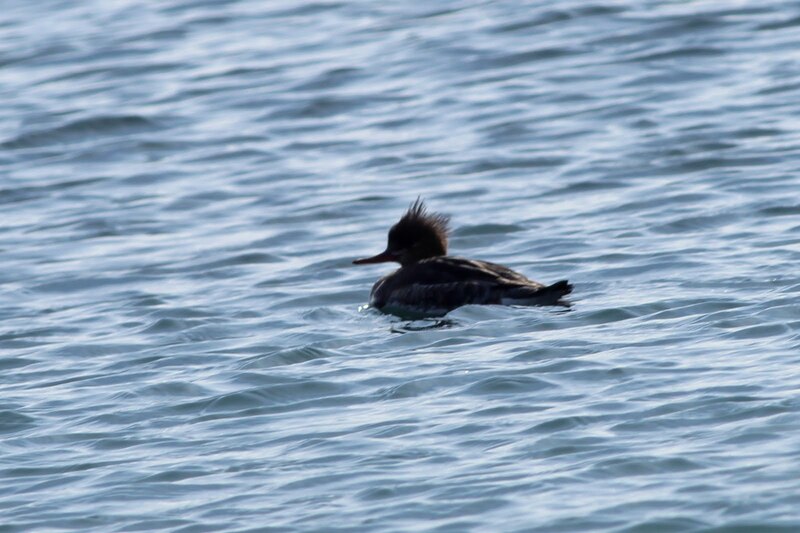 The red-breasted is similar to the Common Merganser, but has a much more spiky looking crest. The bill is much thinner and there is no sharp delineation between colours on the neck. As I was scanning for loons, something caught my eye, a large brown shape in the water about 50 to 70 meters away. 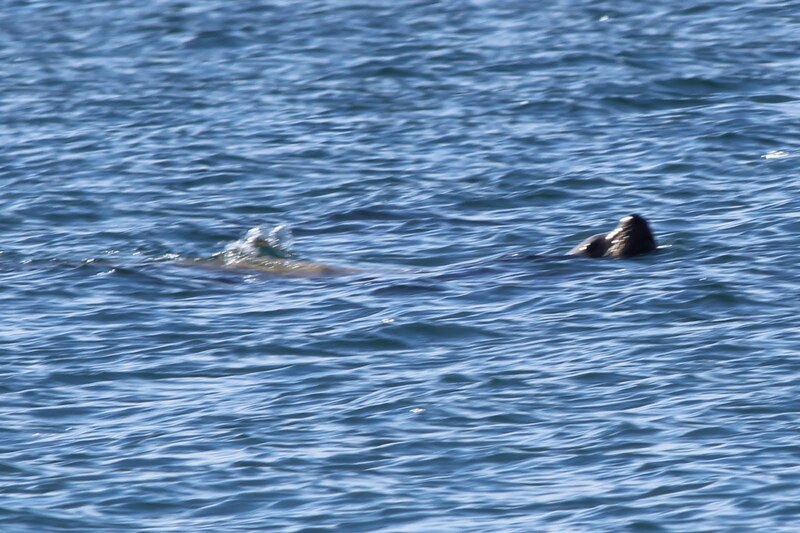 I got my scope on it and identified it as a Sea Lion. I tried to take photos with the IPhone through the scope but the waves made that quite difficult. I eventually located in with my Canon SLR and took a few shots that blew up reasonably well. 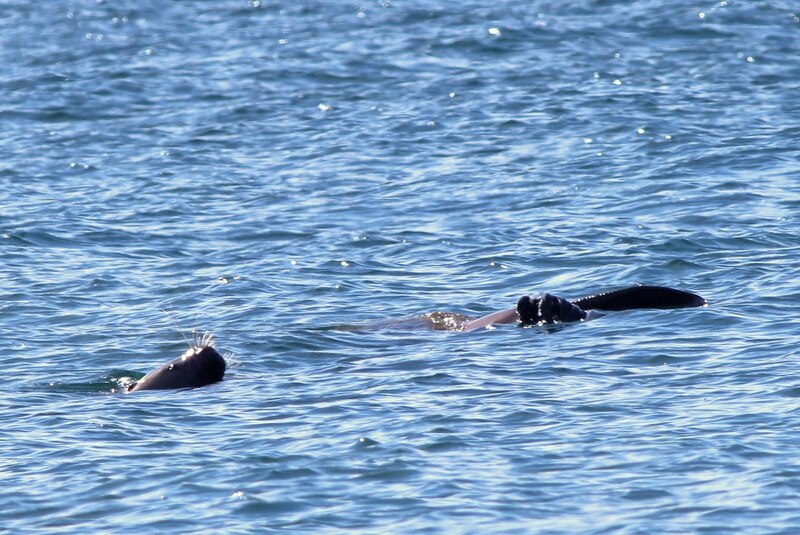 When I saw the photos at home, I concluded that there were two Sea Lions rather than one. Based on the size I identified them as Steller Sea Lions. 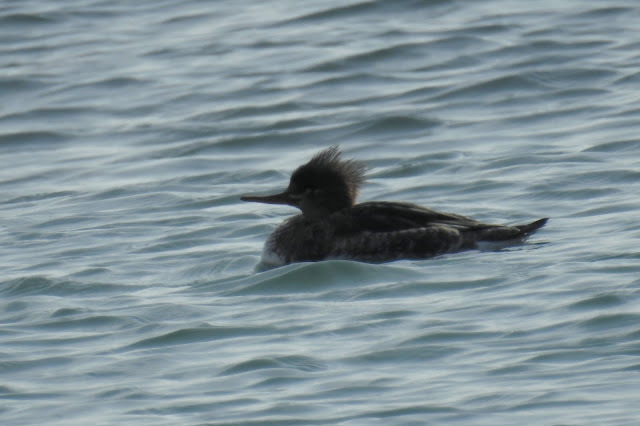 I spotted a Common Loon in the same area. It had caught something and was fighting with it to finish it off. 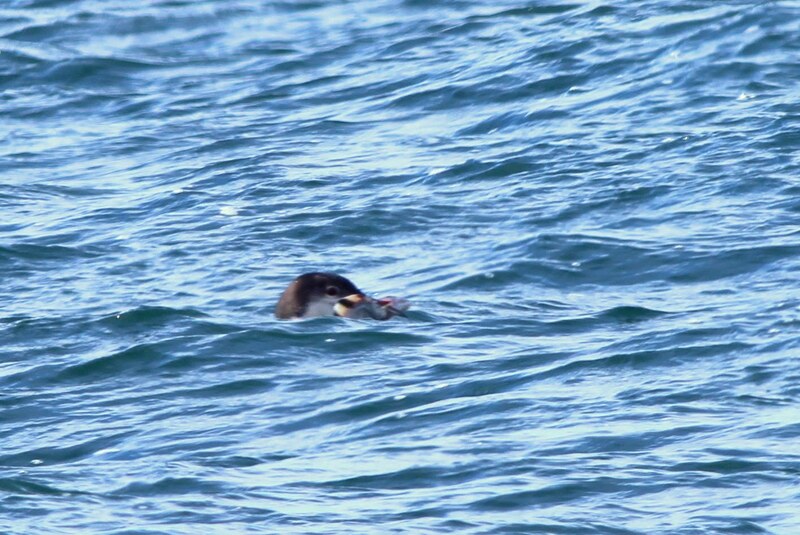 This battle went on for quite a while, the Loon would throw it in the water and then retrieve it, give it a shake and then do it again. As I watched this battle, a group of Cormorants flew by. 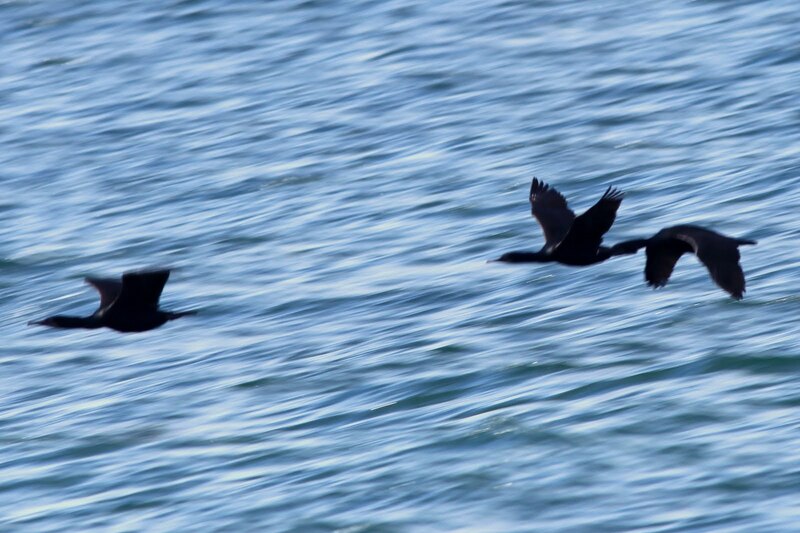 I took a couple of very poor photos and am identifying them as Pelagic based on shape and the thin bill. 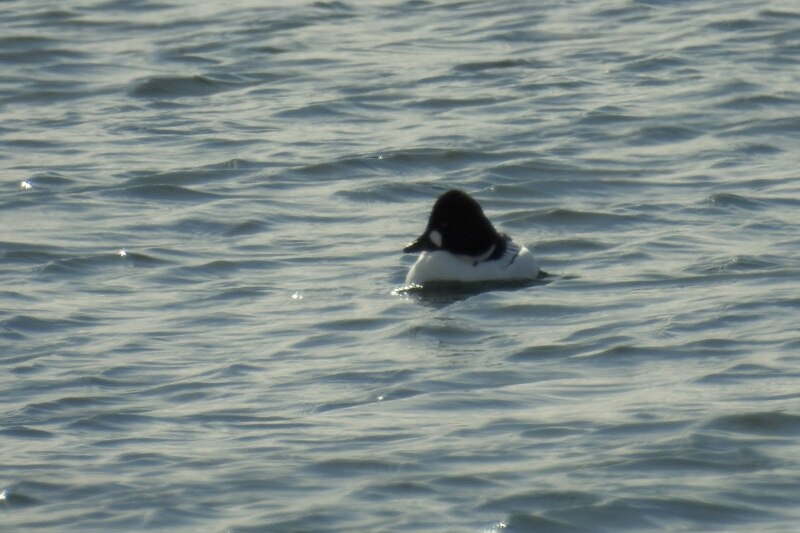 The last bird I saw at Point Roberts was a male Common Goldeneye, I'd seen the female earlier in February at Brydon Lagoon. I left Point Roberts and made a quick stop at a pullout on the Tsawwassen Ferry Jetty. There was one duck close by and I got one shot of it. 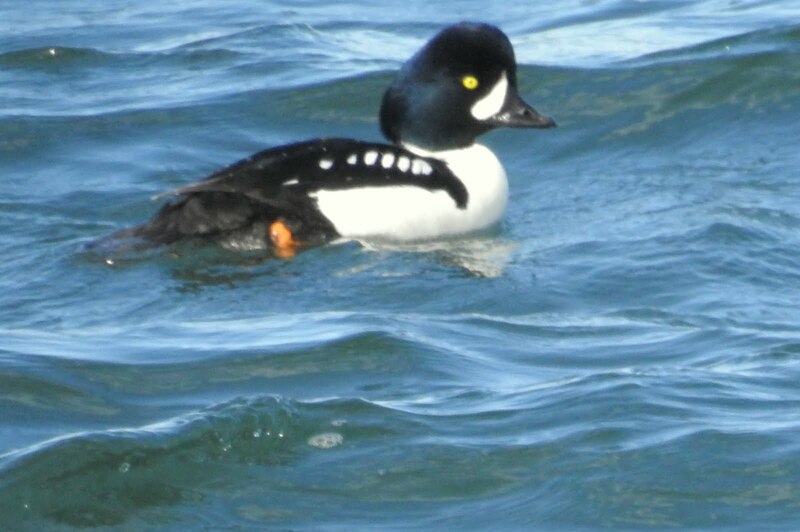 This is a Barrows Goldeneye. It can be told from the Common by the shape of the face patch (rounded on the common, crescent shaped on the Barrows). The head shape is also different (peaked on the common, low and flat on the Barrows). Finally, the white circles on the side are not present on the Common. This ended my February birding, it would be three weeks before I got out again.